RBSG 17 grand tasting. Expecting a smoked beer from the label, and instead found a nice sweet, savory braggot. Pit fruit, , savory spice, some vanilla too. Toasted marshmallows? Wonderful creamy feel, mild warmth, plums and melon. Slick and slippery. Enjoyed a bottle of this at a recent bottle share. Glad I got to try this in a small sample because it is not my thing. Dark tea leaves and honey dominate the aroma and taste but just did not work for me with this beer. Very interesting. Had held up very well. Dark pour small tan head. The honey and tea are very present in the smell and taste. Very sweet. Vanilla is added in the taste. No smokey taste others have reported. Really enjoyed this. 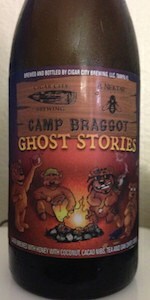 Goes very well after the camping trip I just came off where we sat around the camp fire telling... ghost stories! Rich flavor and aroma with a very full body. A bit sweet until the end of the finish. Smooth body but with some heat (alcohol). 750ml bottle poured into a Barrelworks Teku. A: pours a smoky dark smooth chocolate color with a nice 1/2" mocha head. Decent lacing but the head diminished quickly. Have sat on this one for quite awhile due to early comments about it being too sweet. S: like nothing I have smelled before, definitely a nice medium dark chocolate, touch of vanilla, a bit of tea?, and a touch of smokiness. T: everything that was on the nose was present with a burnt chocolate aftertaste. Very complex and like nothing I have had before. M: smooth and velvety. Carbonation was a little low but with the aging was not surprised. O: wow, a very interesting brew. I really enjoyed it and as above like nothing I have had before. Smooth and not overpowering on the sweetness. Might be tough to drink a whole bottle but was fortunate enough to be able to share this one.